Creative Mothers Day gifts are what make Mothers proud. It takes true inspiration to find or create just the perfect gift to express how you feel about your Mom. Mothers make us who we are; they are our first introduction to learning where love originates - in the heart of a Mother. From this point, all that we learn as a daughter we mostly learn from our Mothers. We've designed a beautiful verse card which is perfect for summing up the feelings of all your mother has done to make you who you are. If you're looking for a great online Mother's Day gift, make your Mom's day with this complete package. The wish vessel is filled with holographic pixie dust - different colors which symbolize the love you wish to return to your Mother in thanks for all she's done and what she means to you. All you need add is your love and signature. The gift box sets the tone....it's the shape of a puffed up pillow-type triangle! Most creative! So....add faith and trust, and a little bit of pixie dust, and your Mother will feel all of your love, admiration and respect that you want to share with her. They say it's the thought that counts -- but sometimes thoughts are very hard to express just the way you want to. Captured Wishes to the rescue! Our company's philosophy is based on helping you to make your loved ones understand just how you feel. 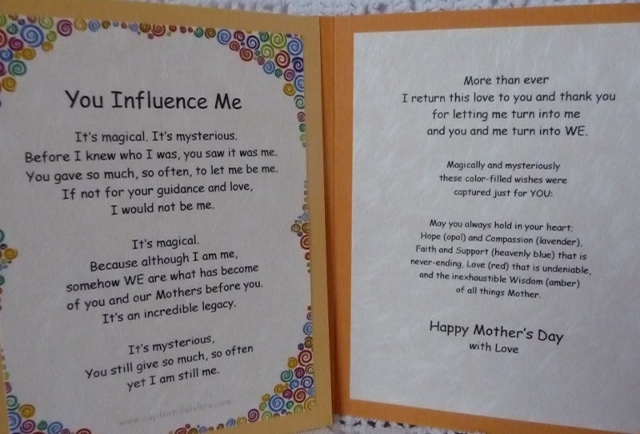 You Influence Me is a perfect way to make your Mom know just how much you appreciate all that she's done for you. Your Mom will adore the gesture as much as she does the delicate Captured Wish vessel with its layers of Fairy Dust and shiny charms. The wish vessel (24mm height including cork x 37mm wide) contains carefully layered Fairy Dust, explained by the color key.